All things must pass, and now so has Trouble, the lapdog turned multimillion-dollar heiress who most likely lived out her golden years without realizing she was the world’s most hated Maltese. Trouble, who was 12, drew fame and vituperation when her adoring owner, the billionaire real estate and hotel tycoon Leona Helmsley, bequeathed $12 million to her. The public loved to hate Mrs. Helmsley, called the Queen of Mean and seen as emblematic of 1980s excess, and the public came to loathe Trouble after Mrs. Helmsley died in 2007 and news broke of the dog’s windfall. Trouble died on Dec. 13, though news of her death surfaced only on Thursday. The cause of death was not released. The idea of a human year being equivalent to seven dog years is a misconception, experts have said. But according to the Pedigree pet food company, at 12, a Maltese is a “senior dog,” who would be about 64 in human years. Many saw Trouble’s inheritance as an example of Mrs. Helmsley’s eccentricities and mean-spiritedness, as two of her grandsons had been excluded from her will. Fluffy, white and testy, Trouble became both wanted and hated: she received two dozen death and kidnapping threats along with a few offers from eager breeders. When Mrs. Helmsley’s brother refused to care for her, Trouble traveled by private jet from New York to Florida in September 2007, flying under the alias “Bubble” to keep the ill-intentioned off her tail. Trouble died much as she lived, cosseted and coddled, tended to round the clock. She spent her final years in Sarasota, Fla., where her caretaker was Carl Lekic, the general manager of the Helmsley Sandcastle Hotel. Keeping with the dietary requirements of an elderly lady, Trouble was weaned off her rich diet by Mr. Lekic. She had been hand-fed crab cakes, cream cheese and steamed vegetables with chicken during her time with Mrs. Helmsley, but once in Florida, she began dining on dog food from a can. “Trouble has gone from caviar to Alpo,” John Codey, Mrs. Helmsley’s longtime friend and adviser, said on “The Early Show” on CBS in 2008. The change seemed to suit the four-and-a-half pound Maltese, who gained a pound. Mr. Lekic said in the affidavit that he had known Trouble since she was born, and had become “very friendly with her,” playing with her during Mrs. Helmsley’s visits. But among Mrs. Helmsley’s inner circle, Trouble was known as a biter. She bit Mr. Codey. She bit Mrs. Helmsley. She bit Mrs. Helmsley’s onetime housekeeper, Zamfira Sfara, so many times that Ms. Sfara sued (the case was dismissed). Ms. Sfara told The New York Times in 2007 that Trouble was protective of Mrs. Helmsley and would not let anyone get close to her. Mrs. Helmsley, in turn, called Trouble “my first bodyguard,” and demanded she be referred to as “Princess” rather than “the dog.” Trouble was in advertisements for the Helmsley Park Lane Hotel; in one ad, she appeared festooned with pink bows. 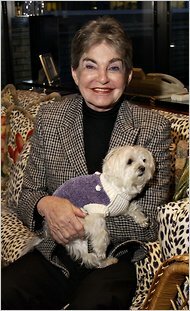 As Trouble luxuriated in Florida, several animal rights groups banded together to sue the Helmsley Trust in 2009, saying that the foundation had ignored Mrs. Helmsley’s express wish that her trust’s money go “to purposes related to the provision of care of dogs.”The groups said the trust, which has about $3 billion in assets, was allocating just a small fraction of its grants to dog causes, but a Manhattan judge ruled against them. The groups filed an appeal on Thursday. Wayne Pacelle, president of the Humane Society of the United States, one of the plaintiffs, said Trouble had proved to be a distraction in the case. It was unclear why news of Trouble’s death, first reported by The Daily News, had been delayed almost six months. Trouble was cremated and her remains were “privately retained,” said a spokeswoman for the Helmsley Trust. In her will, Mrs. Helmsley asked that Trouble’s remains be buried alongside her own, in the Helmsley mausoleum at the Sleepy Hollow Cemetery in Westchester County. But Jim Logan, a member of the cemetery’s board, said Mrs. Helmsley’s lawyers knew the cemetery would abide by regulations that forbid the interring of nonhuman remains at human cemeteries. That said, mausoleums are considered private property and the Helmsley family had its own key.